From 65 to 82 € the night I book ! 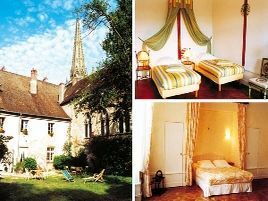 A listed building, the 'Maison Sainte-Barbe' is a former canons' residence, dating from the 14th and 18th century, situated in the heart of the old town of Autun. The three rooms and suite are spacious and elegant. Breakfast is served in front of the open fire in the dining room. A rare privilege: a walled garden beside the cathedral!. - Golf d'Autun à 1 km. 1 suite and 3 rooms with bath and WC. 77 euros (1 pers. ), 82 euros (2 pers.). Extra bed 20 euros. The closest station is Autun, located at 1 km.